By distilling the key facts and regulations from international food law for professionals in the food industry, the world's ten most important food markets are surveyed in terms of regulatory standards, principles and the authorities involved. No legal training is required! Evelyn Kirchsteiger-Meier is a senior lecturer and Head of the Centre for Quality Management (QM) and Food Law at the Zurich University of Applied Sciences (ZHAW). She holds a Master`s degree in biology and chemistry from the University of Basel, Switzerland. Before joining the ZHAW, she gained extensive experience in industry by working for Nestlé, the Swiss-based multinational food and beverage company, for 11 years, as QM/food safety manager. Since 2008, she has lectured in food law, food safety and quality management at both Bachelor and Master levels, and has taught numerous adult eduction programs. She also leads several projects in the field of food law and food safety in collaboration with external partners and institutions. Furthermore, she organizes and chairs an annual conference in food law, which has gained a prominent position within the food industry and the competent authorities in Switzerland, and regularly publishes on the subject of food law. Dr. Tobias Baumgartner, LL.M. (Eur.) is vice director of the Europe Institute at the University of Zurich (EIZ). He studied law at the Universities of Frankfurt and Mainz, obtained a Master?s degree (LL.M.) in European and International Law from the University of Bremen and a Doctoral degree (Dr. iur.) from the University of Zurich. He gained work/research experience in Hamburg, Hong Kong and New York. His fields of expertise cover the areas EU constitutional law, EU business law, IP law and food law. 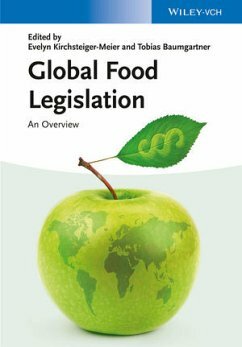 In his position at the EIZ, he advised the Federal Office of Public Health in the area of EU food law. Furthermore, he is a lecturer in an advanced study program on Swiss and EU food law, which he has established in cooperation with Evelyn Kirchsteiger-Meier from the Zurich University of Applied Sciences (ZHAW).